Try hitting the ball with different parts of the bat (when you are in an empty field). Does it always work the same? Hold the bat loosely in one hand and throw the ball at different parts of the bat at the same speed. You should find that the ball seems to bounce off parts of the bat better than others, and sometimes when it doesn't bounce well the bat vibrates a lot. Although a bat feels quite stiff, it can actually flex and vibrate a significant amount. A bat can vibrate in a huge number of different ways, but the most important are the slowest two 'modes' of vibration. Vibrating the bat takes a lot of energy so the more energy which goes into vibrating the bat, the less there is left for the ball so it will bounce of slower. The slowest or fundamental mode is where the bat bends into a slight C shape in one direction and then straightens out and then forms into a mirror image of a C. In this case there will be 2 points that aren't moving. For the second slowest mode the bat forms into an 'S' shape and then the mirror image of an S shape, in this case there are 3 points or nodes which aren't moving. If you hit the bat at a node of a form of vibration then the bat can't vibrate in that mode. The Two slowest modes will absorb energy the best so if you hit it at one of their nodes, or a sweet spot as it is known, then the ball will go much further. Does anything else affect how it feels to hit the ball? 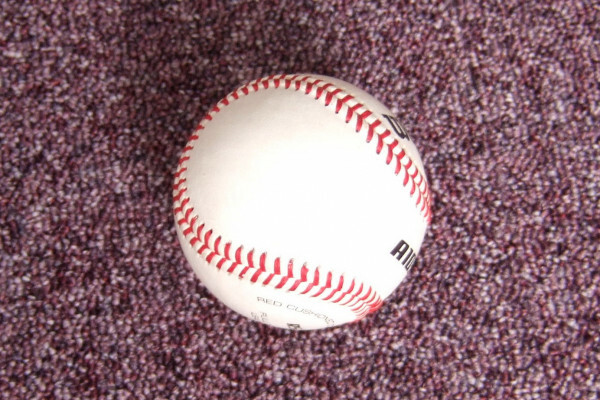 When the ball hits the bat, the ball is both pushed backwards and it starts to rotate. So if you hit the bat above the centre then both the rotation and the movement will be pushing it out of your hands, if you hit it right at the bottom it rotates so fast that it falls out of your hand the other way, but in between there is a point called the centre of percussion where it doesn't try and move your hands at all so hitting the ball there is very comfortable. Hitting a piece of wood above, below and at its centre of percussion. Previous How useless is a Chocolate Teapot?